Arts in Education Week took place last month, and since then arts education has been on my mind and in the air. A recent blog post by Alan Yaffe - here -- that contended arts education advocacy should be focused more on art-making than art-viewing got me thinking. It is true, much energy goes into trying to get K-12 students to attend arts events, and that's wonderful and much-needed. We try to organize class trips, and bemoan the increasing challenges of getting access to buses, to getting the OK to leave school for an arts experience when the pressures of sticking to curriculum and "teaching to the test" are ever-present. And arts groups do all they can to provide "enrichment", to facilitate those out-of-school experiences and to also bring teaching artists or arts education programs into schools. But ultimately, and I think virtually all arts groups and teaching artists engaged in this work would concur, the most important component is having qualified arts teachers in the school providing consistent day-in day-out arts instruction. And by arts instruction I don't mean just "appreciation" or preparation for an out of school experience, but the actual teaching of the practice of making art. And this is not just visual art and music - the two art forms most commonly offered in schools -- but dance, theater, spoken word and media arts. Increasingly, even when schools do have arts instruction, it is a single music or art teacher trying valiantly to serve an entire school, often providing only the most superficial level of arts instruction to each student, making it impossible to engage in high-level "art-making" education. When I was in Philadelphia, even before the recent massive budget woes, the school district pledged to achieve the goal of having ONE art OR music teacher in each school, and even that anemic goal was considered Utopian, given how far away it was from being attained. How do we solve this challenge? Arts funders increasingly fund robust arts education programs operated by arts groups - symphony orchestra, dance companies, art museums, etc. - as well as by arts-education-specific organizations. And even if they don't directly fund such programs, increasingly the presence and quality of such programs is an important component of how grantees are evaluated. This is a very positive trend that has supported excellent programs throughout the country. The conundrum is that with rare exceptions funders DON'T fund the actual salaries of qualified arts teachers in schools. Even if it were possible, there is a strong sense that this cost should be borne as part of the school budget - that it is an essential educational expense, and that if funders took the cost on it would be a slippery slope and send exactly the wrong message - that arts were a frill and less important than math, science and other areas of instruction. So it seems that what is needed is a refocusing or reframing of the arts education advocacy argument to more forcefully target the hiring and support of arts teachers in the schools. For all of the controversy recently around Teach for America (TFA), maybe we need an "Arts Teachers for America" program that recruits and pays artists to spend a couple of years (or more!) after school or grad school in a public school classroom as an arts teacher. Maybe arts conservatories could participate as partners, since a growing number of schools realize they must provide a more well-rounded education to their students so that they are better prepared for a career that will require teaching skills as well as business skills. Maybe the time commitment SHOULD be longer, to blunt the concern with TFA that teachers some in relatively unprepared and then don't actually spend enough time for the full benefit of their engagement to be realized. And even if the commitment is only a couple of years, maybe a significant portion of these artist-teachers would decide to stick with teaching. Maybe something like this already exists but I don't know of it. Went on the TFA website, and even if they are placing arts teachers it is not mentioned anywhere, though they do reference the need for math and science teachers. There are some AmeriCorps arts programs but they seem to be widely dispersed and local (for example, a program in Maryland that is operated by Maryland Institute and College of Art). What about a major national effort, backed by the federal government and some major national foundations that provides matching funds for the hiring of new certified arts teachers in public school, requiring local investment as well? Maybe engage arts conservatory programs in the effort too. Many of them are frankly grappling with what is the "new normal" for their graduates. Increasingly even graduates from elite music conservatories like the Curtis Institute may find that their students cannot count on a career consisting just of playing for a good living wage for a major symphony orchestra. Their career is likely to now also involve teaching, and even if they secure one of the plum orchestra spots, that job too increasingly involves education and outreach. Not to mention that increasingly artists WANT to do this work - want to be more engaged in the community, to inspire young people; to use the term promoted by Yo-Yo Ma and Damian Woetzel in their Aspen Institute work, they want to be citizen artists. Curtis has in fact just launched the ArtistYear Fellowship program, part of the Aspen Institute's Franklin Project. This is a very promising development, and will place three recent grads in a year-long program of bringing music into Philadelphia under-served communities and schools. But it stops short of a more extended period of actually serving as in-school music teachers with the training to do the job. An interesting related approach, which I just saw last week in action in the public school system in Nashville: The Pearl-Cohn Entertainment High School, part of the Academies of Nashville program. This school integrates the full spectrum of the entertainment industry, from making music to recording, film production, marketing and advertising - even styling - into a full academic curriculum. The school is "adopted" by the industry, which supplies donated state of the art equipment, mentorship, internship opportunities, etc. Many of the teachers are drawn from the industry with vast experience. The kids are learning because the focus area - a creative enterprise that engages them - is woven into all academic disciplines. A policy statement "Arts Education for America's Students: A Shared Endeavor" was recently endorsed by Americans for the Arts and a wide array of other leading arts education organizations. 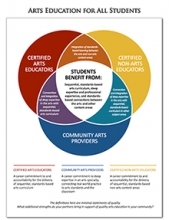 This document articulately lays out the complex web of players and practices that make for a strong arts education system, and it includes a useful "venn diagram" that shows the interrelationship of certified arts educators, community arts providers, and certified non-arts-educators. And I don't mean to undermine the value of this excellent statement or the importance of community arts providers, out-of-school experiences, etc. What I do mean to do is assert that the toughest - and perhaps most important - piece of this challenge is getting more certified arts educators in the schools, with a reasonable enough workload that they can truly serve their students in a deep, not superficial, way. School budget restrictions, hiring freezes, limitations on principal autonomy - all these and more contribute to how difficult it can be to tackle this aspect of the challenge. But let's acknowledge that it still remains hugely important and we need to have more strategies to tackle it. During my time in Philadelphia I watched the School District strive mightily to dramatically increase the number of arts teachers - often challenged by being able to find enough qualified candidates - only to then have to turn around and implement massive layoffs when a huge budget gap opened. I observed first-hand that there was no substitute for an extraordinary arts teacher in the school, what a gift it was for those students lucky enough to have one of those teachers. Let's work harder to ensure more kids benefit from that gift... At the same time, when we can't achieve quality arts teachers in the classroom, lets make sure kids get extraordinary arts experience AND instruction, delivered by great teaching artists!